Over its five years, Bent Paddle Brewing Company has changed a lot. 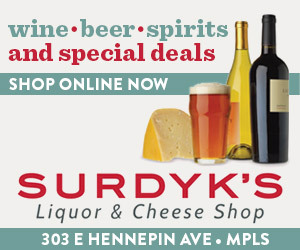 It has expanded into the city’s largest brewery, producing 16,705 barrels in 2017 and distributing its beer throughout the entire state of Minnesota and parts of western Wisconsin and eastern North Dakota. Since it started with five employees in 2013, the staff has grown to over 40 employees. And with their Great American Beer Festival Gold Medal for the 14° ESB in 2017, Bent Paddle became the first brewery in the area to take home GABF gold. 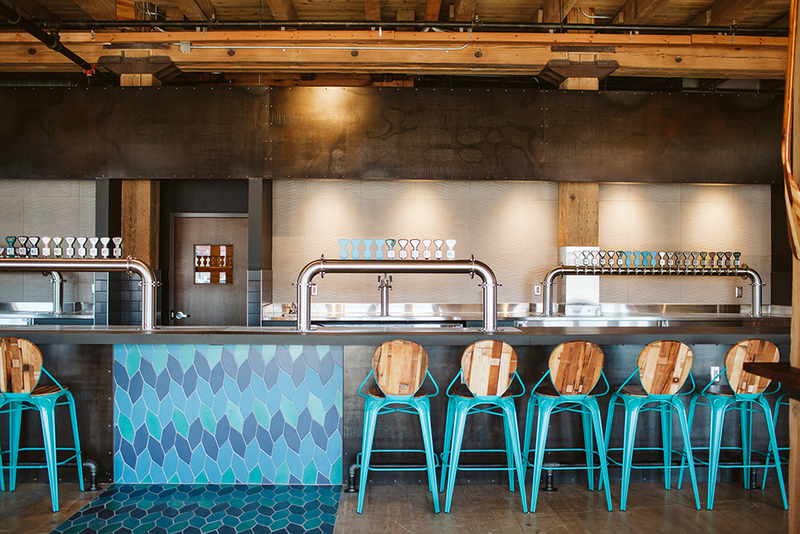 Yet through all of this change, one piece of their business remained relatively stagnant over the years—the taproom. While respectable, Bent Paddle’s original taproom no longer lives up to what the brand has become. That will change on April 12, when the company’s new 5,000-square-foot taproom and pilot brewery opens. 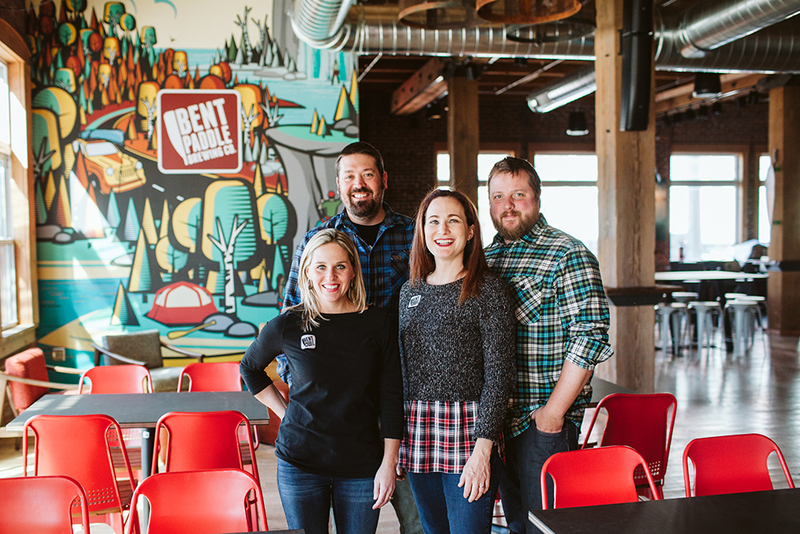 Founders and married couples Bryon and Karen Tonnis, and Laura and Colin Mullen, crafted their plans for Bent Paddle before the “Surly Bill,” and as a result, the brewhouse was the focus of the initial space—not the taproom. Even so, the taproom often became a crowded affair, especially during popular events like All Pints North. To handle increased volume on weekends, patrons in the old taproom spilled into the brewhouse, limiting the hours of actual beer production. “Since it was so busy over there, a lot of the time it’s standing room only, and we wanted this to be really comfortable, where you could get settled in with a pint,” said Karen, adding that they will add more beertenders and ordering locations at the bar in the new taproom to alleviate congestion. 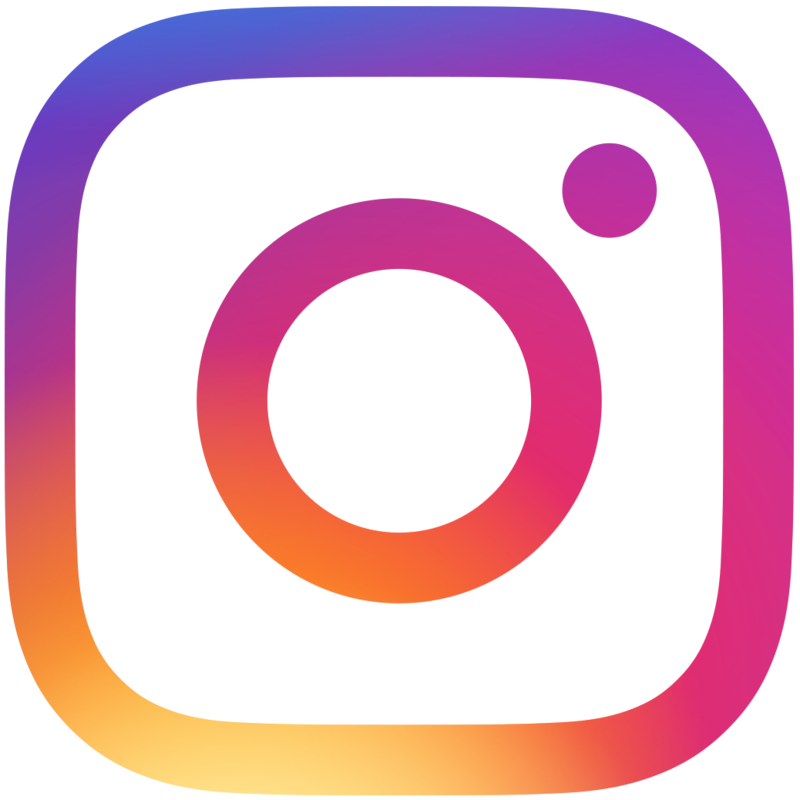 While the group always had plans to expand and develop a destination taproom, the space they selected, located across the parking lot from the brewery/old taproom and directly under their current administrative offices, wasn’t their dream space. In fact, according to Colin, it wasn’t Plan A, B, or C. It was more like F. But when it came up for rent, they began to see the potential of the space. The move not only allows Bent Paddle to serve more customers, but also to brew more beer. 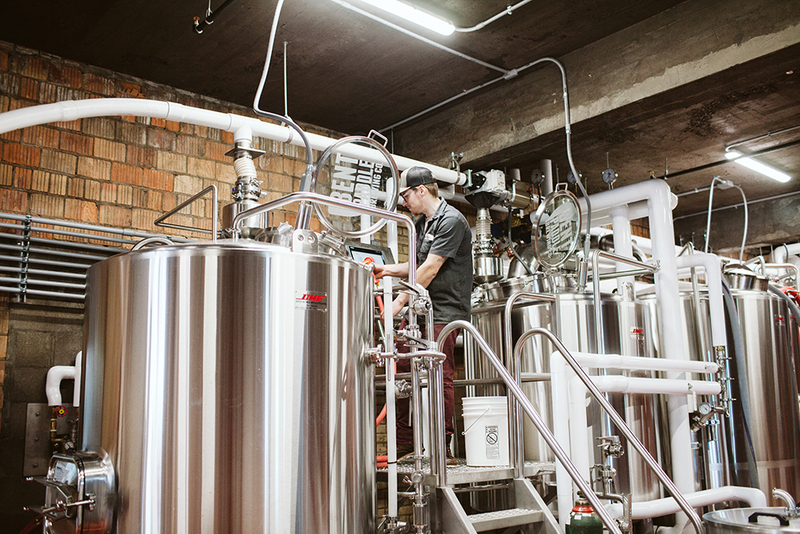 To comply with Minnesota’s taproom laws, they put in a seven-barrel “recipe development” or “pilot” system. With the extra brewing capacity, they plan to introduce two or three new beers upon opening, and the auxiliary system will give them the chance to produce seasonal styles exclusively for the taproom, as well as collaborations and other inventive beers for the marketplace. What’s more, there’s 5,000 square feet in the basement where the cooler is, which will give them extra room for barrel aging. 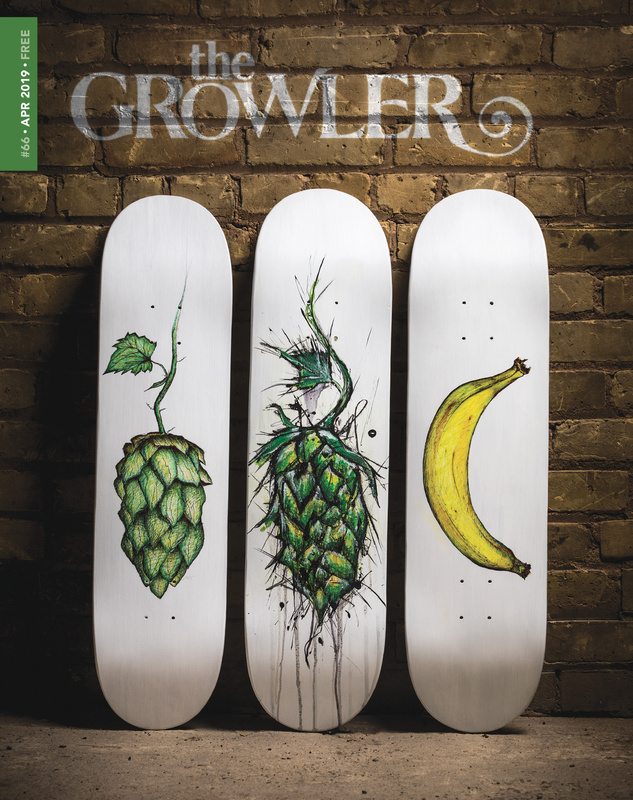 “We were [brew]pub brewers before opening up Bent Paddle, so we were doing tons of seasonals throughout the year. But with a large distribution brewery, you don’t have as much time to do recipe development and come up with new beers constantly,” Bryon noted. 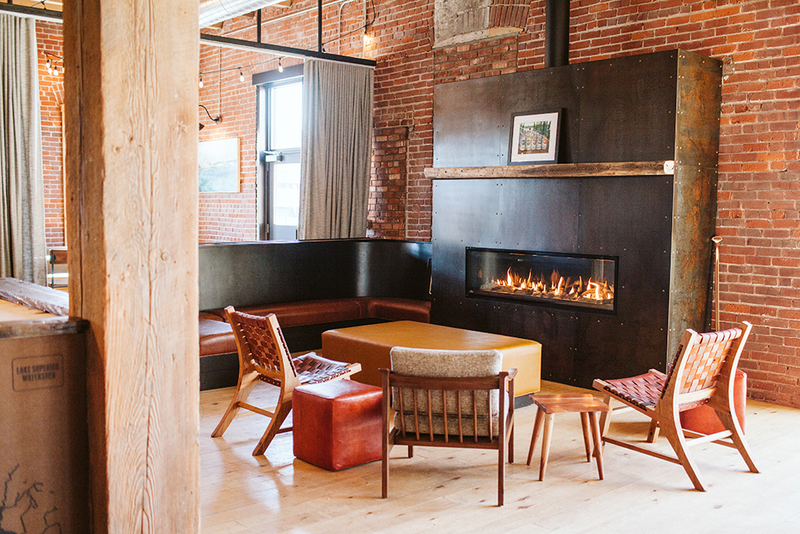 While it has the capacity to hold upwards of 200 patrons, the space belies its large size—in fact, it’s cozy. There’s a fireplace on one side of the taproom, with a series of booths nearby. A long outdoor patio is being completed along the street, giving visitors a view of the old digs. Though it won’t be completed by the opening date, Laura noted that it would be opening by their annual Festiversary event, which this year celebrates the brewery’s five-year anniversary. 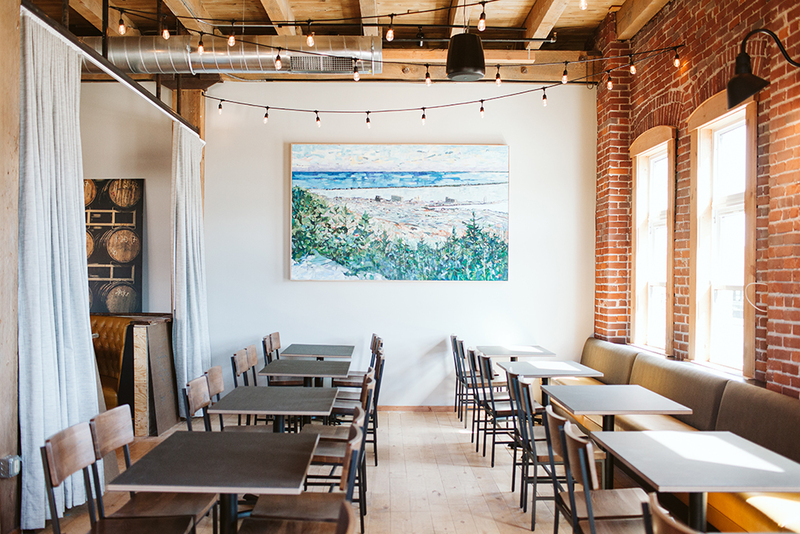 From the stone tile to the lighting fixtures—made with climbing rope and recycled bonfire grates from the city’s annual Bentleyville Tour of Lights—the new taproom is truly a celebration of everything Duluth. 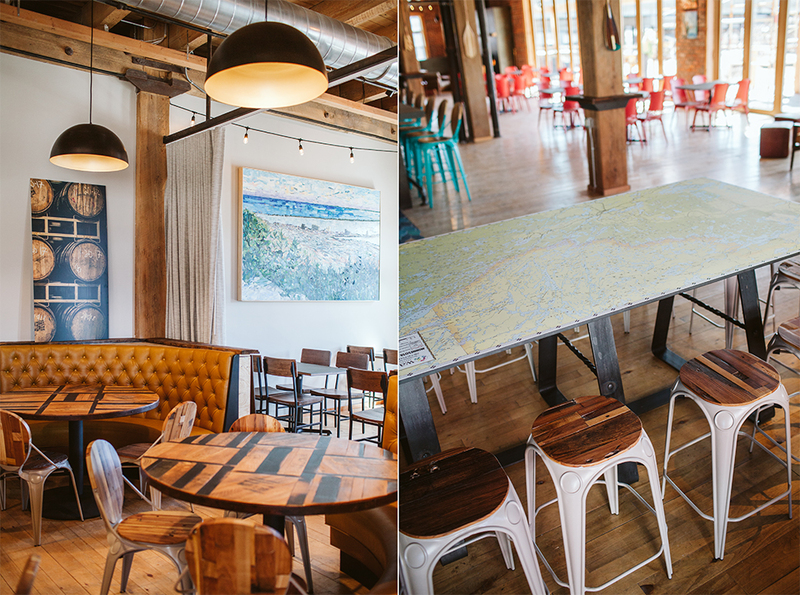 Mostly all the finishes and art inside the taproom was sourced from local businesses. The booth cushions were custom-made by nearby Frost River, and there are chairs purchased from recycled furniture company Loll Designs. Of special significance to Duluthians, the bar top will be made of the Fourth Street maple trees, which were cut down last fall as part of a controversial street expansion project. But the decor also seeks to capture the spirit of the North Shore in its design. Three waterfall mosaics trickle down the 36-foot-long bar, representing the importance the founders place on the Lake Superior water, Duluth’s most abundant resource. And maps of the Boundary Waters Canoe Area Wilderness and Duluth’s mountain biking trail system can be found in the booth backs, a nod to the founders’ passions. 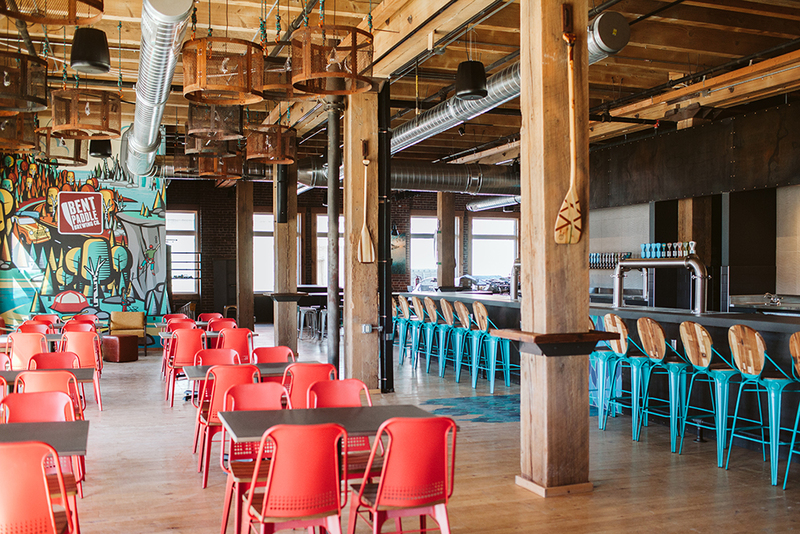 While the founders admit that this likely isn’t their last expansion as a brewery and taproom, the new space is a better reflection of what the brewing company has become. And as a place to tip back a pint, it is a sight to behold, with a unique surprise around every corner.